We’re a little more than three weeks removed from the Kentucky Wildcats, and more specifically in some people’s minds, John Calipari and a talented group of freshmen, winning a National Championship in rather dominant fashion. You know how they did it, you’ve heard all about Calipari finally winning that elusive championship, and we now know that many of the players who were instrumental in the Wildcats eighth National Title will be heading to the NBA. But one of the more dramatic, and frankly misinformed, conclusions that some people have drawn from Kentucky’s triumph over Kansas a few weeks ago is that it spells doom for college basketball. 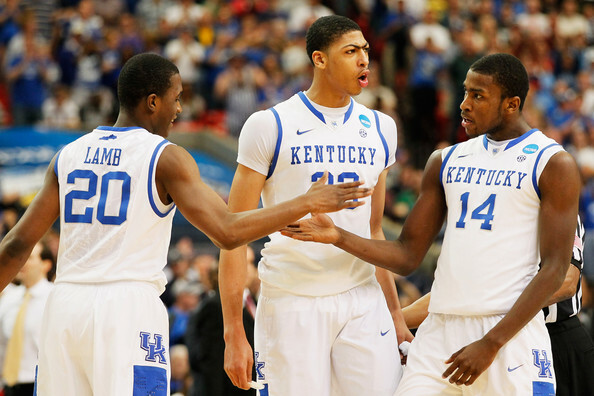 The thought that a group of freshmen could simply take the college basketball world by storm, and that Calipari’s shameless tactic of bringing in the best one-and-done players would actually hold up throughout the pressure of the Tournament to deliver a championship was the equivalent of college basketball Armageddon for some. There’s no doubt that some people’s dislike for Calipari played a role in this irrational belief, but putting the Cal haters aside, part of me understands the argument that Kentucky’s triumph could be bad for college basketball (though, not nearly as monumentally damaging as some are claiming the Wildcats most recent victory was). For the last few years, we’ve watched as Calipari has seemingly had his pick of the top recruits in the country, and then used these players to brazenly construct what basically amounted to semi-pro super teams that consisted of guys who were already looking ahead to the NBA even before their arrival on Kentucky’s campus. We watched as these squads, teeming with talent, fell agonizingly short of the greatest accomplishment any college basketball team can achieve. Soon after these heartbreaking losses in the tournament, we watched as Calipari’s top guys bolted for the lottery, only to see him reload with the best players from the next crop of incoming freshmen. The problem with this cycle, of course, is that traditional powerhouse college basketball teams were built over many years and that the players were in college because they wanted to be, not because an NBA restriction said they had to be. While many people were critical of the way this cycle had begun to play itself out, these same people took solace in the fact that no matter how many five star recruits Calipari was able to sign, he could never get over the hump and have this recruiting success translate to a title. Whether it was Derrick Rose and Memphis clanging free throws in the 2008 title game, John Wall and DeMarcus Cousins falling to a more experienced West Virginia team in the Elite 8 two years ago, or Kemba Walker putting an end to the Wildcats Tournament dreams in the Final Four last season, everyone who didn’t approve of the way Calipari was building his teams felt vindicated because he always came up short. But now that Calipari has finally won a title (granted, with a little help from guys like Anthony Davis, Michael Kidd-Gilchrist, Terrence Jones etc. ), it would seem to some that his success threatens to crumble the foundations and re-write college basketball as we know it. But here’s the thing; if you didn’t think that the way in which Calipari was running his program before he was suddenly “validated” by winning his first National Championship, there’s little reason to think that what happened in the Superdome a few weeks ago will. I understand that this was the first time Calipari and an immensely talented group of freshmen were able to break through and actually win it all, but it seems to me that those people who claim the sky is falling because Kentucky won the championship are overreacting and misunderstanding what this championship actually means. We all knew that Calipari’s way of running his program was a high-risk, high-reward way of operating, but those who thought it was an accident that Calipari’s teams had reached four Elite Eights, two Final Fours, and been the championship runner-up in his previous six seasons before winning it all this year were just kidding themselves. We knew that going after one-and-done players (at least the way Calipari was) had the potential to bring back a national title to Kentucky or Memphis, it just hadn’t happened. What this championship means is that Calipari and some extremely talented players were finally able to avoid all the roadblocks and pitfalls that had de-railed similarly talented teams in the not-so-distant past, and put everything together during a brilliant six-game stretch in March and April. Yes, Calipari’s resume suddenly looks a lot better. Yes, Kentucky fans once again have a reason to celebrate. 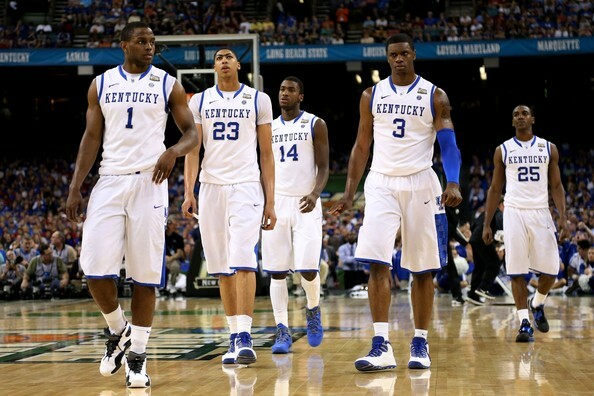 Yes, this team will continue to re-load with top talent as long as Calipari is their coach. But to think that Kentucky, Calipari, and an essentially brand new roster will suddenly be better equipped to win a championship in the coming years because they won this past year, doesn’t have any basis in reality. 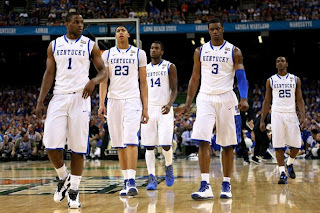 I wouldn’t even try to take anything away from what Anthony Davis, Michael Kidd-Gilchrist, and Marquis Teague meant to this team, but it’s categorically inaccurate to say that they were the only reason why Kentucky won the championship. A lot of people saw Kentucky’s title as proof that one and done players can win it all, but really, this championship proved (once again) that you also need experienced players to win a championship. What Doron Lamb, Terrence Jones, and Darius Miller brought to the Wildcats this past season can’t be understated, and while Davis and Kidd-Gilchrist stole the spotlight, this title was almost as much about what the returning players on this team contributed. It’s a long season so I won’t go over everything Lamb, Jones, and Miller did in December and January, but just from their performances in the tournament, it’s clear to see that this team wouldn’t have gotten very far without them. Lamb’s borderline unconscious shooting against Kansas in the National Championship game allowed Kentucky to open up a comfortable lead (one which they needed to weather a late Kansas rally), but he also shot the lights out against a feisty Iowa State squad in the second round (5 of 7 from three) and he chipped in 21 huge points that helped Kentucky hold off Indiana in one of the highest scoring games of the tournament. Jones didn’t put up huge numbers in any of the tournament games, but his 12 points, 9 rebounds, 6 assists, and aggressive play against Baylor helped to set the tone in the Wildcats 82-70 Sweet 16 win. Furthermore, Jones stepped up to the challenge of guarding Thomas Robinson in the championship game, and although Robinson recorded a monster double-double (18 and 17), Jones’ physicality forced Kansas’ Player of the Year candidate to shoot just 6 of 17 from the field. Finally, Miller’s senior leadership was invaluable throughout the tournament, as were the 19 points he scored against both Indiana and Iowa State, and the 13 he contributed against Louisville in the Final Four. When we think back on Kentucky’s title team from 2011-12’, Anthony Davis and Kidd-Gilchrist will be the first players that come to mind, but the Wildcats star freshmen had plenty of help from more experienced players that Calipari likely won’t have the luxury of turning to in the coming years. The more everyone watched Anthony Davis, the more we realized that this 6’10’’ shot-blocking machine was something special. You’ve been hearing about how good Davis is for the past few months, and his status as the undisputed number one pick in the upcoming NBA Draft is just another example of how good this kid is/was/has the potential to be. His ability to lead the Wildcats in scoring without dominating the ball on offense, while also shooting over 60 percent, made him one of the most efficient scorers in college basketball and a rare kind of superstar who doesn’t need the ball to make a huge impact. Of course, what makes him a truly special player is his ability to block shots and essentially shutdown the paint. I know it seems almost impossible, but there were actually three players in NCAA history who blocked more than the 186 shots Davis did during his freshman season. Even so, the way he protected the rim ranks him up there with some of the elite shot blocking college big men of all-time (at least since the NCAA started recording blocks as an official statistic in 85'-86'). Players like David Robinson, Shaquille O’Neal, Alonzo Mourning, and Emeka Okafor have all experienced similar success blocking shots at major conference programs, and although it’s impossible to say what the future holds for Davis, it’s easy to say that he’s a once-in-a-decade player in the college game and perhaps even more than that. Even with all of Calipari’s recruiting guile, big men like Davis don’t come around very often, and it seems unlikely that he will be able to find another player this good for a long time. In addition to his special ability to block shots and change the game without dominating the ball, Davis’ demeanor and attitude about the game was extraordinarily rare for a player of his skill level. Maybe Calipari has found in the past, and will find in the future, more talented players than Anthony Davis, but I seriously doubt he will find a big man with this kind of skillset who is also wired for greatness in the same way that Davis is. Of all the amazing things that Kentucky achieved this season, the fact that Calipari was able to get a group of 18 and 19 year-old college kids to focus on team success over everything else might be the most impressive. With big time recruits come big time egos, and some of his teams in the past have featured talented players who didn’t completely accept the “team first, me second” philosophy the way this year’s team did. On any given night it didn’t matter to the players on Kentucky who the star was or who had the best numbers, as long as the team won. This is an increasingly rare way for a team of extremely talented, “we’ve got one foot out the door to the NBA” group of college kids to approach the game. This isn’t to say that at least a few of the guys on Calipari’s teams of the past haven’t bought into the team-first mantra but it’s often the case of one bad apple spoiling the bunch in these situations (for a while there it looked like Calipari was going to lose Terrence Jones this season, but that didn't happen). When you’re bringing in five or six guys who were all top tiered recruits and there are only so many shots and media attention to go around, it doesn’t take a genius to figure out that things might not always be smooth sailing. This Kentucky team will be remembered for a lot of different reasons, but the fact that five (maybe even six) possible first-round picks were able to check their egos at the door for the good of the team, might be the toughest thing Calipari will have to re-create as he chases his second title. Let’s be honest with ourselves, the NCAA Tournament, to a certain extent, is a crap shoot. Funny things have been known to happen to even the best teams, and sometimes it doesn’t matter how talented you are when your opponent shoots 65 percent from behind the arc and the refs hose you all game long. I’m not taking a single thing away from the Wildcats title, and there’s little doubt they were the best team in college basketball this season and completely deserved to cut down the nets a few weeks ago, but it’s hard to deny that a few things fell their way in the Tournament. Arguably the two best teams in the field other than Kentucky, Syracuse and North Carolina, experienced big losses to key players that may have cost them a shot to challenge the Wildcats in the championship game. Maybe the losses of Fab Melo and Kendall Marshall didn’t change the complexion of the Tournament, and maybe Kentucky would have beaten either team if they would have met in the finals, but it certainly makes things easier when two of the best teams in the nation suffer big personnel losses right before or during the Tournament. Additionally, while Kentucky beat some good teams on their way to their eighth championship, they didn’t run into that one team who played above their heads for 40 minutes and got hot from behind the arc. Obviously, Kentucky’s elite defense and stifling athleticism is a huge reason why they didn’t run into such a team, but not every three missed against Kentucky in the Tournament was a contested one, and every team (no matter how good) needs a little bit of luck to avoid that bad matchup or hot shooting team at an inopportune moment. John Calipari’s way of running a program finally yielded the ultimate prize any team can hope to achieve in college basketball, but unless you can guarantee that he’s going to have impact players with Tournament experience returning to school with regularity, he can find another player as brilliant as Anthony Davis, he can get all of the guys on his team to play unselfishly and for the good of the team, and that Kentucky has a few things fall their way in the Tournament every season, I don’t think we’re in danger of college basketball as we know it disappearing. Yes, Calipari is a force in college basketball, but let's be honest, he was a force before he won his first championship as well. The sky isn’t falling because John Calipari won his first title, it’s ok to look up.